You are currently browsing the archives for the Moved category. For designer floor products, this airy, huge (4,000 sq feet, 30 ft ceiling) new carpet showroom has always been known by word of mouth – and that’s a good sign. For the past 49 years, this family-run business has been selling quality carpeting from major American and European mills. It’s their hands-on personalized service which keeps everyone coming back. Popular now, wood-like vinyl planking, wall-to- wall carpeting for movie rooms, and a large collection of carpet tiles are all here. They also carry area rugs (contemporary, transitional, traditional, natural, custom), runners and exclusive designer carpet lines. For both carpeting and area rugs, they can do custom borders, add fringes, do finishings and also handle repairs and carpet cleaning. If you’re looking for entrance mats or even logo mats, just come here. Since they buy in volume for their commercial sales, they can meet and beat the prices of their competitors. Commercial clients know to come here for carpet, tiles, and vinyl flooring. Once you’ve entered, expect the friendly staff to give you an education on flooring. Their mission is to provide you with exceptional service and quality products, at the most affordable prices – and they meet these goals consistantly. Here’s an idea for Valentine’s Day – a classic watch. Starting out in 1945, Mosel, a family business evolved into luxury goods; Their their loyal clientele have followed them through a few moves over the years. In their boutique-y new showroom, they carry name brand watches (Mont Blanc, Seiko, Victorinox/Swiss Army, Skagen, Michels Kors, Diesel, Simon Chang), pens (Mont Blanc, Sheaffer, Montegrappa), jewelry (Italgem, Opera), and cool gadgets like the Secrid RFID wallets which block scans of your credit cards. Corporate clients like to give engraved gifts so they sell different items like clocks and even kitchen knives by Swiss Army, which could say “Happy Valentine’s Day”. 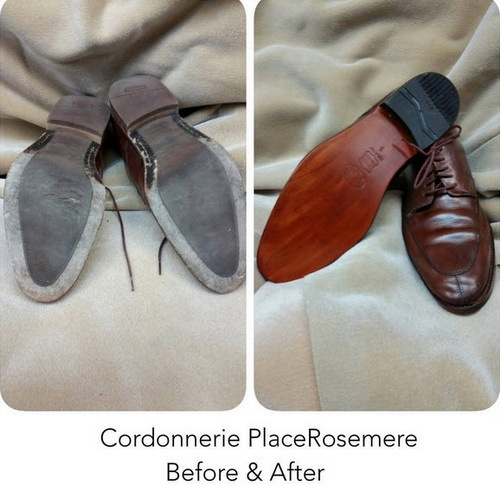 Before you tuck away all those scruffy, winter-worn boots and shoes, think about taking them over to an amazing shoemaker at Cordonnerie Place Rosemere who can make them look new again. His skills were learned from an uncle who was a master shoemaker for 28 years. The uncle taught him not only how to repair all kinds of shoes but also how to fix vintage bags, rips from dog bites and broken heels making them all look virtually brand new. 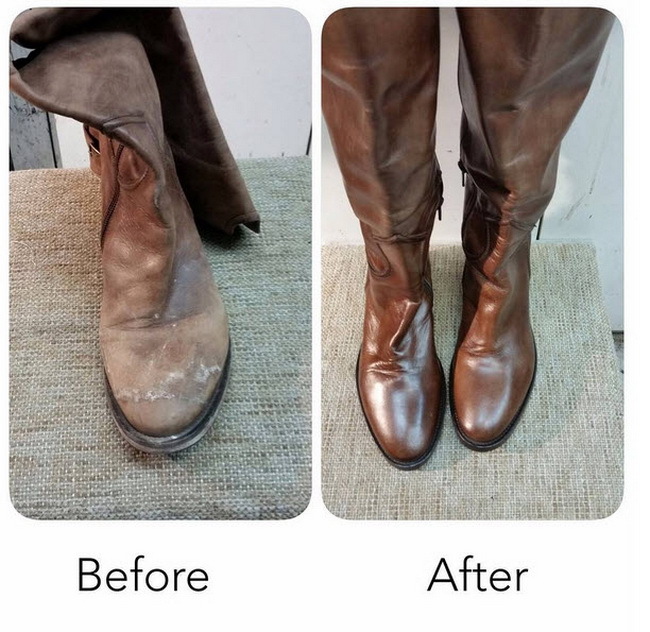 Shiny slippery leather soles can be made safer and last longer when he improves them by making them non-slip. You can have your high heels raised or lowered here, purses can be repaired, bags, jackets and shoes can be re-dyed and boots that are too wide can be put on a diet. This skilled repairman can do the master work required on really high end shoes – Louboutin, Jimmy Choos, Stuart Weitzman, Chanel, Salvatore Ferragano and Gucci. He can, of course, fix your regular brands too. Products for shoe maintenance can be found on the shelves as well as non-slip grips for traction, worn on the bottom of your shoes – this is Canada after all. 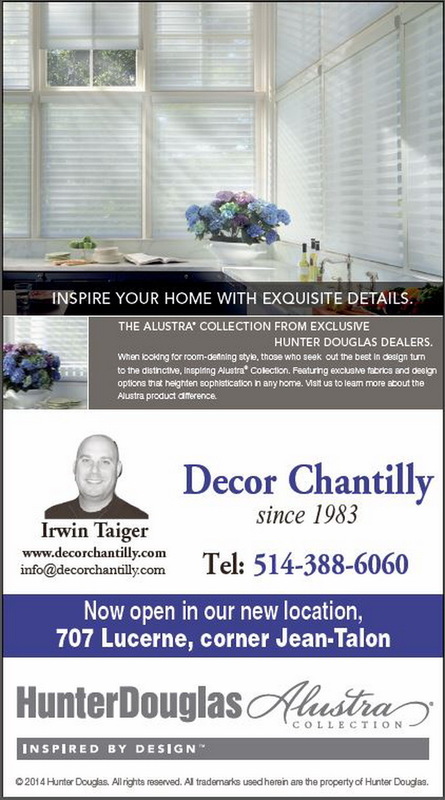 Tapis Decor Chantilly has been proudly serving the community since 1983, offering one-stop decor shopping for both home and office, in one location, at competitive prices. For flooring, they sell the gamut from carpets to laminate floors, solid hardwood to engineered wood, linoleum and marmoleum, as well as PVC strip wood and tiles. They carry a huge array of window coverings from well-know manufacturers, custom-made drapes and bedding, wall coverings,and ceramics. They supply and install all of their products; their installers are certified and experienced, and they are RBQ licensed. Why run from one place to another when you can come in and browse calmly and efficiently through everything you need for all of your home decor. You can even put your feet up and call for their free shop-at-home service. 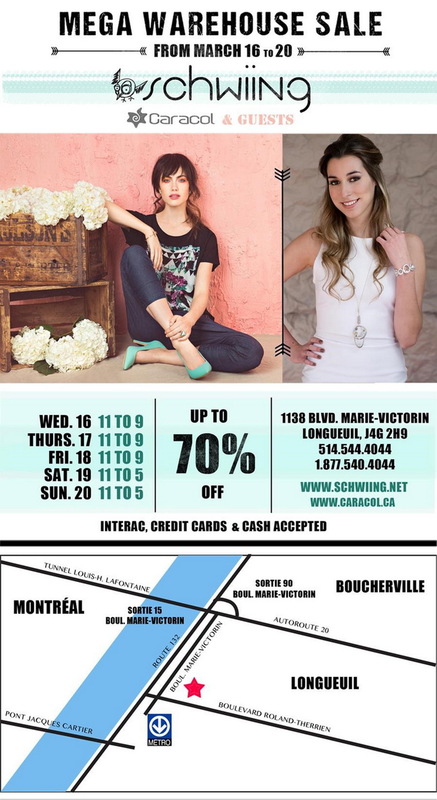 For the first time, Schwiing, Caracol and a few other collaborators will be holding their Mega Spring warehouse sale on the South Shore in Longueuil. Take advantage of discounts up to 70% on clothing, coats, jewelry, handbags, accessories, lamps and much more. Lots of parking available. Strollers are welcome and plenty of changing rooms. A sale not to be missed! Click on this link http://woobox.com/twmeum to enter a contest that they are having, where there will be 5 winners of a $100 gift card each, and it may be used at the sale. Read the fine print. 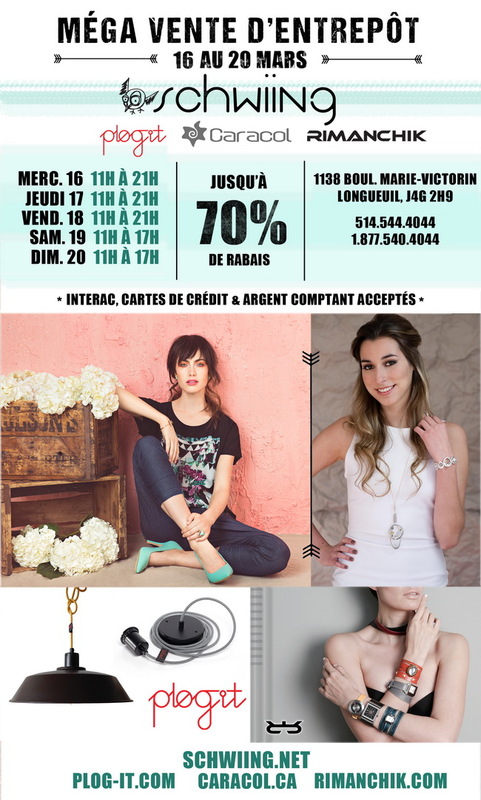 At TifClip, you can buy professional hair care products and tools like Argan Oil, Babyliss Pro, Biosilk, Dikson, Lakmé, Pravana, Marrakesh Oil…which the salons use and you can too, if you shop here at their new location on St-Denis. Styling products such as boar’s hair and ceramic brushes, clippers and trimmers, gels, waxes can be found. Professionnal hair dye (Dikson, Fantasy colors) and free consultation is offer and a repair service for your electricals is also available! Q: Is there still a shop to refurbish old pots and pans ? A: Yes but you have to take a drive to Rawdon as the store has just moved. Clinique de la Casserole Del Mar has a handy guy who can do spot welding, replace handles and knobs, polish stainless steel, aluminum or copper, refinish copper, or sell you parts for Presto pressure cookers – gaskets, safety valves and sealing ring sets. You can also buy polishes, pots and pans – Strauss, Cool Kitchen, Quon Tanium, Integral 3, Meyer, – as well as pressure cookers to 12 qts. and pots for induction cooking. Breville cordless coffee pots, toasters, juicers, are here along with Sanelli, Miaybi, Global and Henckel Twin Line knives. Look for the little tasting bowls and crackers to try out new products, buy humbugs (now in different flavors), or feast on their own 5-year-old cheddar and their homemade fudge. If you can’t decide, there are ready-made gift baskets or custom-made ones too. Q: Was looking for Ophelie Hats, where are they now? A: Ophelie Hats has moved to 3868 Boul. St-Laurent – right across from Schwartz’s. They now have a store front. You can expect to find a really good selection hats for women and men. 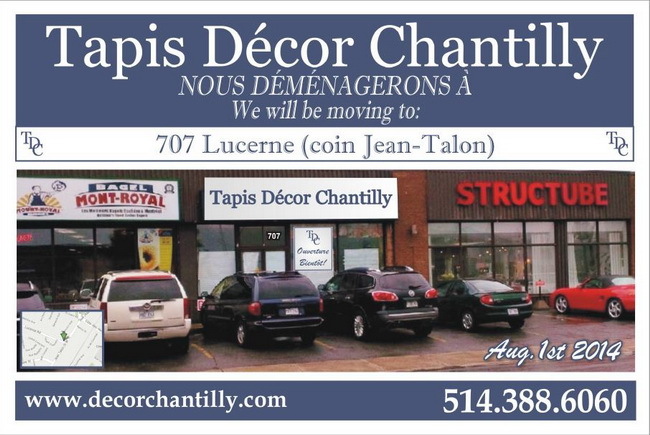 Tapis Decor Chantilly has been open since 1983, offering one-stop decor shopping for both home and office, in one location, at competitive prices. For flooring, they sell the gamut from carpets to laminate floors, solid hardwood to engineered wood, linoleum and marmoleum, as well as PVC strip wood and tiles. They also carry a huge array of window coverings from well-know manufacturers, custom-made drapes and bedding, wall coverings, ceramics and more. They supply and install all of their products; their installers are certified and experienced, and they are RBQ licensed. Sit back and let their in-house designers walk you through every step, or feel free to go in with your own designer. – Carpets: Wall to wall, area rugs and runners, in all shapes and custom sizes for residential or commercial, in wool or synthetic, from Shaw, Mohawk, Beaulieu, Couristan, Momeni, Louis de Poortere and others. 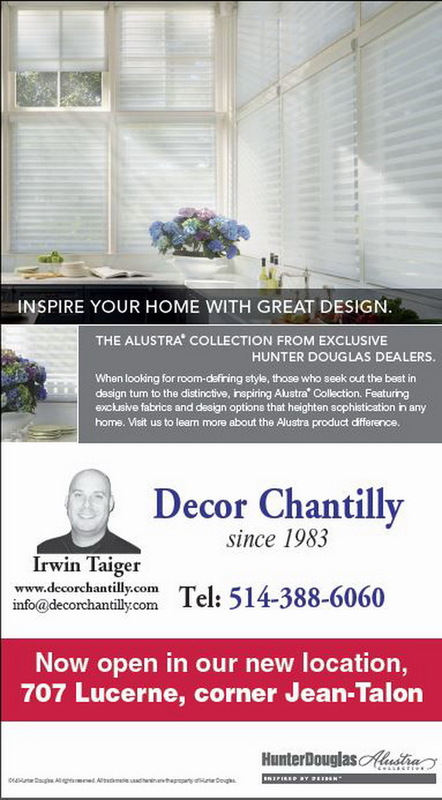 – Blinds and Window Coverings: High end custom window coverings from such well-known brands as Hunter Douglas, Maxxmar, Altex, Faber, Shade-O-Matic and more. If you need them, they sell motorized blinds and black-out coverings. – Flooring: Laminate floors from names like Alloc and Kronotex. Marmoleum sheet goods are anti-bacterial and perfect for health care or just for healthy environments. Expect a huge array of vinyl tiles such as Armstrong and Amtico, LSI and Centiva, Mondo tiles and Plynyl woven flooring. There are all kinds of special rubber, which is perfect for your home gym or recreation center. From materials for computer rooms (anti-static), lobbies, corridors, elevators, bars, airplanes or any other application, it’s all here. – Fabric: They carryRobert Allen, Kravet, Joanne, Rosedale, Avant-garde and more, in silks, satins, velvets, chenilles, leathers or other types of fabric. They employ their own seamstresses and upholsterers to create decorative valences, headboards, draperies or other ideas you may have. You can even put your feet up and call for their free shop-at-home service. New Location: 707 Lucerne Rd., T.M.R.